The Cardinals won last night 5-4, their second straight walk-off win over the Reds — this one on a walk-off hit by pitch to Jon Jay (although it wasn’t the first time this season the Cards won in that way.) The victory put them at a season-high 11 games over .500. 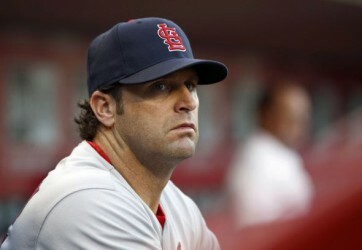 And, following the game, manager Mike Matheny said the above words. It’s a hard team not to love. Hmmmm. How many fans feel that way about the 2014 Cardinals? There’s certainly been a lot of discontent among Cardinals fans this season, more than I remember seeing in a very long time, and I am right there with those not enjoying things much. The main reason: Mike Matheny. Sure, I know not every fan feels that way — I see the giddy social media posts and the tweets exclaiming how their record is even better now than it was at this point in 2011 and the continued gushing over Matheny’s looks. And I see the results from the games, even if I haven’t been as diligent in making sure I watch every single one like I have in past years. Yep, the record is 68-57, they’re 2 1/2 games behind the Brewers, they’re leading the wild card race by 2 1/2 games over the Giants and Braves at the moment. There also are things to enjoy about the season. Jhonny Peralta’s play, which includes setting a new record for home runs by a Cardinals shortstop with his 17th last night on this mammoth blast. Lance Lynn’s success, which will be tested tonight as he matches up with Johnny Cueto. (As a complete aside on Lynn other than he’s starting tonight and the Little League World Series is under way, check out this article about his memories of his experience in Williamsport, Pa.) Pat Neshek’s emergence or resurgence or whatever the proper way is to classify his 2014 success. And, well … there have been great streaks and great moments by Matt Adams, Matt Carpenter, Kolten Wong and Oscar Taveras that have been very fun to watch. Even Peter Bourjos has had his gorgeous moments. And it’s certainly looking very possible the Cardinals will again make the postseason. As we know very well, anything can happen then. Maybe I’ll be more excited if that happens. Or maybe not, since it could just be reinforcing to Mike Matheny that the way he’s managed, the way he’s made his favorite players oh-so-obvious to the detriment at times of even the team’s chances of winning, is just fine since it produces results. Winning is all that matters, right? Even when it seems to come despite the manager? Back to Mike’s quote at the top: he certainly touches on all the proper and traditional Cardinals themes, doesn’t he? Grit. Fight. That scrappiness and determination are hallmarks of The Cardinal Way. But a hard team not to love? If you take out the “not,” absolutely. And all because of Matheny himself. This entry was posted in 2014 Cardinals and tagged Jhonny Peralta, Lance Lynn, Mike Matheny, Pat Neshek by Christine Coleman. Bookmark the permalink. If STL really wants to get rid of matheny – most KC Royals fans wiould trade you Ned Yost – and throw in a little cash…..
Spot on. I don’t find it hard not to love them at all. Cardinals fans need to take a deep breath. This is indeed a team to love, one that is potentially very, very special. The records show that no team in the past 20 years that finished last or second to last in runs scored made the playoffs, and only two have had winning records. This Cardinals team should not have a winning record, let alone be in the hunt for a division championship. But they are. Over the past couple of weeks, the Cards have moved up in runs scored, but they still rank towards the bottom. What I get that did I not understand before is the the Mozeliak / Wolvertheny combo have built a team to withstand the brutal St. Louis summers but primed to compete in the August / September stretch. Which they have done the past three years (two of which are Wolvertheny’s, the 2011 is Mozeliak’s). The streak may not continue. Lord knows, the team as undergone a significant transition from last year and still competes. What more do you want? So, Cardinals Nation, take a deep breath and be grateful we’re still in the conversation. The past four years have been a glorious time. Severe discomfort is part of the price of fan loyalty, but you just need to get over it. What more do I want? Well, for starters I would like Mathenatron to show some sign of being human, and for the veteran guys to remove the sticks from their butts. Anything else would be just be gravy.